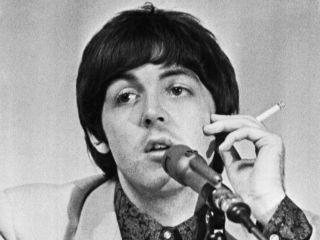 Paul McCartney is dead. Of all the rumors and tall tales surrounding The Beatles, this one has had the longest legs. And now, thanks to an upcoming DVD, that famous bit of folklore (that some still claim as absolute truth), it's about to get even more mileage. Titled Paul McCartney Really Is Dead, The Last Testament Of George Harrison, the DVD (check out the trailer below) purportedly contains audio tape of George Harrison claiming that McCartney met his death in November of 1966 as the result of a car accident , a rumor which spread like wildfire amongst Beatles fans in the late '60s. The DVD uses recordings, featuring a voice "identical to Harrison," that allegedly arrived at the office of Highway 61 Entertainment in 2005. As the voice tells it, after McCartney's death, the bassist was replaced by a double. British intelligence, MI5, had forced the Beatles to cover up McCartney's death to prevent mass suicides of Beatle fans. However, the remaining Beatles tried to signal fans with clues on album covers and in songs. Until now, the 'Paul Is Dead' mystery that exploded worldwide in 1969 was considered a hoax. However, in this film, George Harrison reveals a secret Beatles history, chronicling McCartney's fatal accident, the cover up, dozens of unknown clues, and a dangerous cat and mouse game with 'Maxwell,' the Beatles' MI5 handler, as John Lennon became increasingly reckless with the secret. Harrison also insists that Lennon was assassinated in 1980 after he threatened to finally expose 'Paul McCartney' as an impostor. Oy, we say. But according to a press release, "Highway 61 Entertainment has corroborated most of George Harrison's stunning account of the conspiracy to hide McCartney's tragic death. Harrison's complete audio tapes narrate this film that includes all the newly unearthed evidence. The Last Testament Of George Harrison may prove to be the most important document in rock and roll history, leaving little doubt that Paul McCartney is really dead." Yeah, sure. And an impostor wrote most of Sgt Pepper and came up with the grand, mini-suite that encompassed side two of Abbey Road. Tell us another one.